Archer can do some serious damage on inferior balls (left), but the K9X Ball is holding strong! Ellie loves her ball so much, she must protect it from everyone! Nothing like playing a little fetch with the bounciest ball out there! I'll bring it back, but I won't give it up! Harley is worn out because he finally has a ball he can't destroy! Gemma highly recommends the K9X Ball How can you say no to that happy face? Nova and Odin are two tough pups! Part of a group that supplies police and military working dogs with equipment, Nova and Odin tested out our K9X Ball, they weren't disappointed! Thank you Dogs On Duty! Did you know Ruger will be helping Military Vets who suffer from PTSD? With such a tough job, he'll need a tough ball, looks like he found one! Thank you Gateway K9 Support Dogs for Veterans and First Responders! Wicked Phoenix loves the durability of the K9X Ball! As a Malnois, she goes through A LOT of toys... Finally, she met her match! You may recognize Maynard from our Hall of Fame! Yep, he's also in our Happy Customer album. Despite being a Hall of Famer, no other toy even comes close to lasting as long as the K9X Ball when Maynard is chomping on them! Ollie is a big fan of fetch. She loves the best bouncing ball out there! Josie has shredded nearly every toy she’s owned. Her K9x Ball is now over a year old! 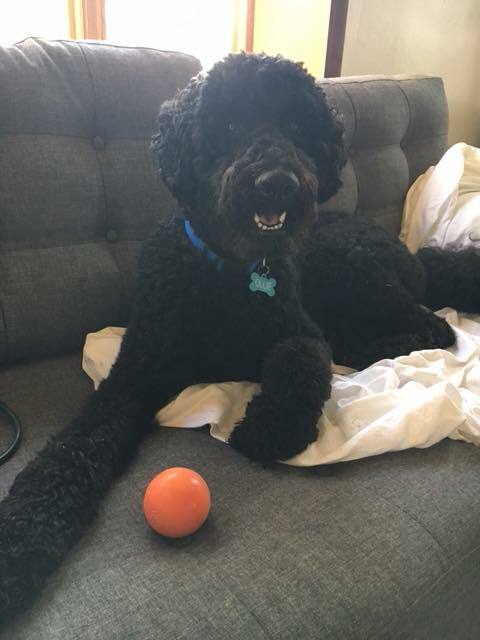 Huck is here and finally has the perfect ball! If Sookie can't destroy it, neither can your best friend! Meet Mac! Mac destroys everything in 5 minutes until he met the K9X Ball. He seems rather surprised he couldn't destroy it! We met Felix at the Mega Indy Adoption Event. He carried around his K9X Ball the ENTIRE time he was there! After getting adopted, he was unfortunately returned to Red Sky Rescue in Indiana, but without his ball! We had to remedy that situation, and mailed him a few more. He's proud to be a K9X Dog, will you be his proud new owner? Febe is one of our very first customers. She may be small, but Mom says she's quite the power chewer! It's been 10 months now and K9X Ball is holding up far better than any other toy in the house. Abel spent some time with our friends at the APA Adoption Center. She thoroughly enjoys her K9X Ball. Good news though: Abel found a home! Ripley had a heck of a day. 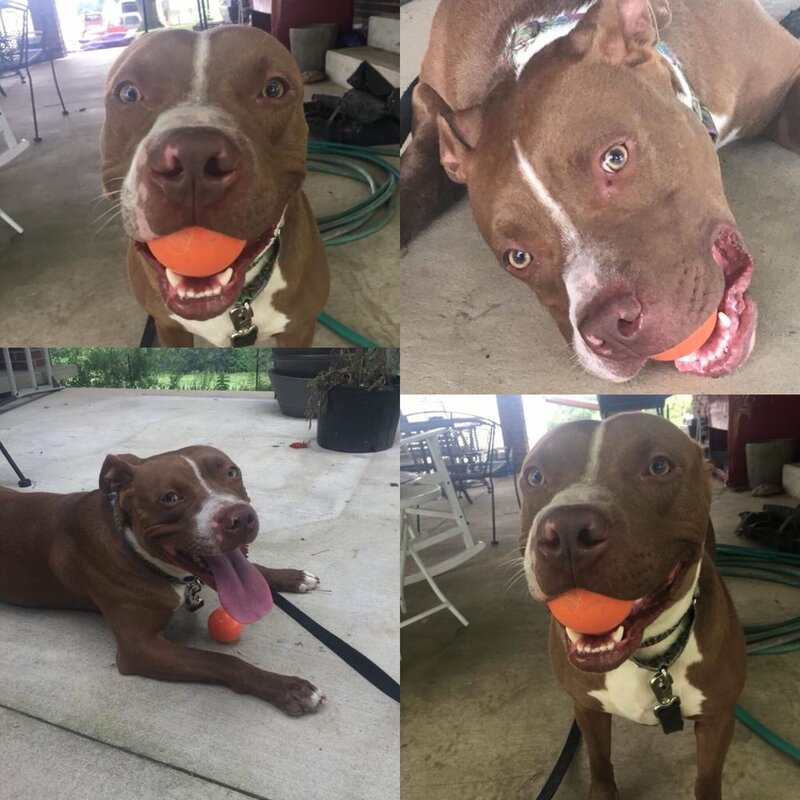 He found his new home AND his favorite ball! Yay Ripley! Don’t let that cute smile fool you, Sasha is a Coyote hybrid and absolutely nothing has defeated her tough jaws. Her K9X Ball is now 5 months strong!